June was busy. Ginger was away on business for a couple of weeks, and three days after she got home I was off working in Austin for ten days. We said we’d have some “Lake-time” when I got back. That didn’t happen and Ginger is much more conscientious than me, so when I suggested a short break, she opted to stay at home and work in an airconditioned office while I sweated it out in the predicted low nineties temperatures. There’s not been a lot of rain, so access to water prompted me to decide to go to Piney Creek Wilderness and hike down to Table Rock Lake. Once there I’d set up a basecamp and relax. I’ve always thought the northern shore of the lake might offer some good wild camping spots, and this was a good opportunity to do some exploring. I had no new gear to test, unless you count my tarp and under quilt, which I’ve only taken out for one night so far. So, the main aim of the trip was to kick back and chill out by the lake (if you can chill out in those temps). Day One – July 25. I still get a kick out of asking my phone to “Take me to Piney Creek Wilderness.” and then get the turn-by-turn instructions all the way to the Pinesview Tower trailhead. What can I say? I’m very easy to please. I arrived at the empty trailhead parking lot around midday. From the trail check-in register it looked like no one had been around since the weekend. The only vehicle at the trailhead. I’ll be back in a couple of days. Trailhead Access Road, or should that be ‘access track’? Despite the heat, I decided to do the hike ‘properly’ — which means not cheating by walking the first half mile along Farm road 2150, thus avoiding the descents and climbs at the start of the trail. I took the Lake Trail from the northern end of the parking lot. It’s a good workout to start a hike with. It drops into two hollows which, of course, have to be climbed out of. At my usual pace (Just over a mile an hour) it took me an hour to get to the point where the Lake Trail sets off down the ridge to Piney Creek. I don’t like descending that trail (to be honest I don’t like climbing it either). It’s steep and the trail is covered in loose gravel, an accident waiting to happen. I almost always opt to take the ‘non-system’, ‘Farm Track Trail’. We’ve called it that because the trail follows the route of an old farm access track. Many years ago tomatoes were grown in the open floodplain at what is now the mouth of Piney Creek. There used to be gate posts visible at one point on this trail, but on my last couple of visits, I’ve not spotted them. The “Farm Track Trail” follows the creek bed in places. The hike down the Farm Track Trail was uneventful, though I toyed with the idea of renaming the upper section ‘Shelob’s Lair’ because of the huge number of spider webs hanging across the trail. I ended up holding my hiking pole out in front of me like some wizard’s staff (I think that’s enough Lord of The Rings references in one paragraph). Piney Creek, as I expected, was dry. 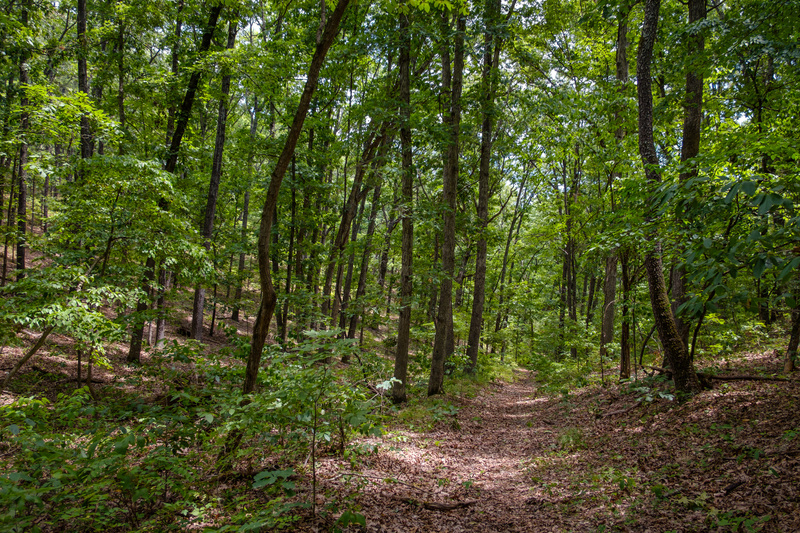 Finding where the Lake Trail entered the large open scrub area that makes up the last half mile of the trail to Table Rock Lake wasn’t easy. Fortunately, because I’d hiked this trail just a couple of months ago I had clues to look for and it didn’t take too long. Hindsight being the valuable thing it is though, I should have just not bothered with the trail and hiked down the dried up Piney Creek. As it was the trail was very overgrown and difficult to follow. In places, the scrub was well over my head, and I was probably muttering out loud a mantra of “Snakes & Ticks,” A machete would have been a help at this point. It seemed like a lot longer, but it only took me twenty minutes to bushwhack my way through the half-mile of undergrowth to the lake. At the lake I found loads of Pipevine Swallowtail butterflies on the bushes, very pretty, but rather timid; they kept on fluttering off when I tried to get pictures. I started the hike with one liter of water, and I finished the last mouthful when I got to the lake. I then filtered 6 liters of water to keep me going for the next couple of days. Let me go on record with the following statement. I despised using our MSR Sweetwater filter — pump, pump, pump. My current filter, the Sawyer Mini Squeeze was supposed to be an improvement on that, and I guess it is. Sort of. The dirty water bag that comes with it is tiny, and it’s almost impossible to fill up. Before I’d squeezed one bag, more water was running out of the dirty end than was dribbling into my water bottle (a sign that the filter needs cleaning — I think it is some sort of pressure relief valve). Despite repeatedly backflushing the filter I never got it to run at a decent rate. It took over an hour to filter those six liters. With that much water, my pack’s weight had almost doubled (6 liters is a tad under 14.5lbs). Fortunately, I didn’t plan to hike much further. I passed the fire rings near the lake, then bushwhacked along the northern shore, keeping an eye out for the ‘ideal spot’. I didn’t have to go far before I found an old fire ring well back from the lake, but with good views through the trees. I was actually surprised how little undergrowth there was under the trees. There was lots of poison ivy around, but it was easily avoided. After checking for widow makers and snagged limbs I picked a couple of trees and set up the hammock and gave it a lie-in test. Fantastic! Then I tried to set the tarp (60° nights and there was a possibility of showers in the forecast). D’oh! The trees were too close together, so I started again with another pair of nearby trees that were the correct distance apart. It didn’t take long (okay, the usual 45 minutes or so) to get everything set up. 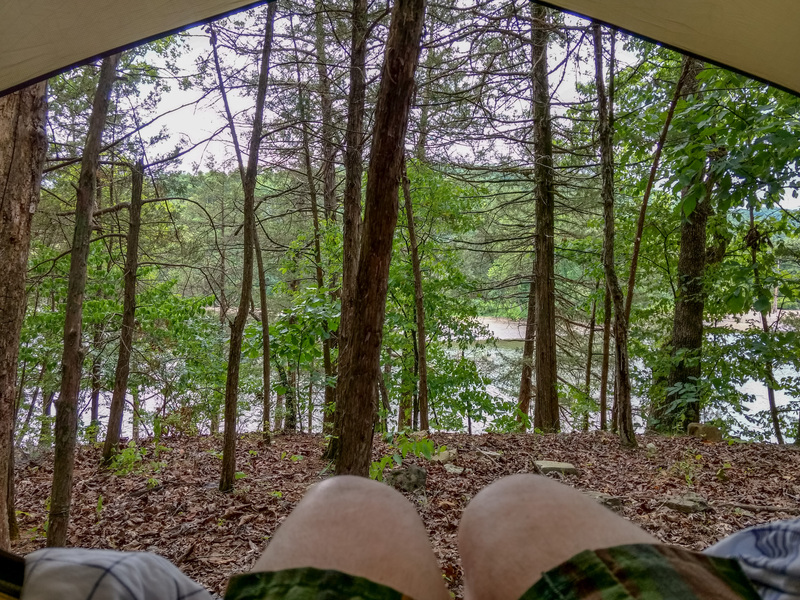 I opted to set the tarp high with a peaked porch (attached to a close-by tree) so I could stand up, and also see out to the lake from the hammock. The lakeshore itself was just a short scramble down the hill and had wonderful views. I grabbed my cooking kit and made and ate dinner down by the lake while watching the sun go down. It was well worth the effort of hiking in the high temperatures and even the time spent filtering the water to be there. The yapping of some bald eagles (they sound like a yappy small dog to me), the very loud croaks of several herons, transitioned to the sound of evening cicadas and the splashing of jumping fish as it got darker. Looking down the lake (east) from the north shore. Lazy picture, I should have climbed up the hill the get my tripod. My meal was a Mountain House Lasagna. It’s not one I’m going to try again. It tasted good enough, but it contained some very sticky cheese that glued itself to my spoon, my teeth, my gums and the roof of my mouth. Not pleasant. Mars, when it rose, was so bright and red, at first I thought it was a house light up on the distant eastern tree line. The fact it continued to rise up into the sky gave away its true identity. I hadn’t cleared out the fire ring and opted for an earlyish night rather than spending time making and tending to a fire. 3.25 miles hiked. Elevation gain: 535ft (I said the climbs at the beginning of the trail were a workout). Elevation loss: 1,007ft. Day Two – July 26. My plan was to sit around and contemplate my navel. I should have guessed that was too good a plan to be followed. Instead, I decided to go exploring. I left my camp set up and took my pack and some lunch to hike parallel to the lake and see if there were any other good camping spots to be found. Showers were forecast for the afternoon, and I headed off under grey skies. The side of the lake is divided up into lots of small hollows where the water runs off the hills to the north. It made for interesting hiking. I was trying to avoid using the deer trails with their attendant retinue of ticks, so there was a lot of bushwhacking to be done. Before long I started seeing signs of a man-made trail and it led me to a broken down fishing/hunting camp. Nearby I found two more, the last of which was impressive in size while hugely disappointing in its accompanying Ozarkian detritus and trash. Apparently “Leave No Trace” has no meaning to at least three groups of people hunting and fishing in the area. The images are geotagged if any public-spirited person with a big boat fancies going in and clearing the mess out. The undergrowth was getting very thick, so I opted to hike along the lakeside. There I saw evidence of active beavers. And then it started to rain. I had decided not to bring rain gear, so I headed back to camp. Fortunately, the trees kept the worst of the light showers at bay. Back in camp, I laid in the hammock listening to the rain pitter-pattering on the tarp. It sounded great, was very soporific, and I slept for far too long, though it was very nice. I had my dinner down by the lake again; Mountain House Beef Stew — and very good it was too. That’s one I will be trying again. I watched the sunset, and then climbed up the hill and lit the campfire I’d set up earlier after the rain had stopped. I’d put a few sticks aside under my tarp so I’d have dry wood to start a fire. Just one small piece of partially burnt wood there. These fine ashes will wash away. I turned in around ten thirty, but I could not get to sleep. I tried reading — The Hitch Hiker’s Guide to the Galaxy — and all sorts of tricks to get off to sleep. None worked. My long afternoon nap was probably to blame. Tossing and turning, I was having trouble with the clothes that I was using for a pillow. They kept sliding under me, and it was also cold enough that I regretted not packing my summer quilt. Eventually, I covered myself with my sleeping bag liner (I’d brought a liner not a sleeping bag), and draped my oversized shemagh over that and used my buff to make a beanie to keep my head warm. Between them they kept me nice and comfortable. 1.25 miles hiked. Elevation gain/loss: 265ft. Day Three – July 27. This is why I use camo / natural colors. Can you spot the hammock? Hiding in the trees – This is why I use camo / natural colors. It was a two cup of coffee morning. I woke tired and decided I’d spend the day lounging around before hiking out midafternoon. The coffee was good, but I decided that more extreme methods were needed to remove the cobwebs, so I went for a swim. The water was as warm as tepid bath water. Next to the shore the lake got deep quickly, so I started swimming towards the middle, and very soon after I felt my foot touch something (Don’t Panic!) I thought it must be a sunken limb or something. Not wanting to get tangled up, I carried on a short way before treading water to take a look around. Only I couldn’t tread water, it wasn’t deep enough. In the middle it was waist deep or less, with a gravely bottom. Some experimentation showed that with the lake at its current (low-ish) level it was possible to walk right across, with the depth varying from neck-deep to waist deep. Patches of cold water suggest that there are ‘seeps’ in the lake bottom here. Back in camp, I received a message that thunderstorms were threatening, so I decided to forgo the lounging bit of my plan, pack up camp, and hike back out straight away. Hiking out along the Creek Bed. It was hot! The trail is pretty easy to follow here. I was back at the van by 2:40 p.m. and sitting in airconditioned luxury. I didn’t see anyone the entire time I was out, and I had all of that part of Table Rock Lake to myself. Absolutely priceless. Oh, and the predicted thunderstorms? They never showed up. 3 miles hiked. Elevation gain: 957ft. Elevation loss: 484ft. I need a lot more practice at sitting around doing nothing. The sound of rain on a tarp will send you to sleep. Take my 40° quilt with me even when the weather is hot. Always hang the tarp first. That way I know the trees are far enough apart before I hang my hammock. I need some way of stopping whatever I’m using as a pillow from sliding down under me. I took too much food. One cup of almonds and raisins a day for trail snack/lunch is too much during the summer. I took more clothes than I needed. I came back with an unworn shirt and a pair of shorts. I think I packed them with the idea that it would be nice to have something clean to change into if I went swimming. However, my thought process while out on the trail was that I couldn’t see the point of getting clean clothes covered in sweat. A buff is very useful. I used mine as a sweatband during the day, and as a beanie to keep my head warm at night. Tyvek isn’t very effective on a slope – it slips around very easily. I’m wondering if fitting grommets to it so it can be staked out might be an idea for pitches with a lot of slope. I need somewhere to keep clothes close to hand, that is not in the hammock as it gets in a frightful mess. I realized I can stow the hammock with the bug net attached. That should make setting up and breaking down a tad quicker. Hanging everything off of the hammock ridgeline gets very cluttered. I need a ridgeline organizer. I need a better water filtering solution. Don’t put your trust in electronics. At one point during the hike, my GPS was convinced I was traveling at 98mph. There are a lot of messy people out there, who will quite happily leave a load of trash in the wilderness if they think no one will find out about it. Back in 2010 when we first started camping, we camped out all through the summer regardless of the temperatures. When we started backpacking, we decided that it wasn’t a good idea to go out when the temperatures were high. I certainly wouldn’t try a strenuous hike when it’s up in the nineties, however, getting out this week has shown me that it is practical to get out in the summer. The number of ticks and bug bites were more off-putting than the temperatures. Thanks, I’m glad you enjoyed the post. I’m chomping at the bit to get out again, and I’ve some new bits and pieces to try out. I’m attempting to cut down my setup and breakdown time, and reduce my pack weight. Thanks for documenting your trip. I liked the Lessons Learned, it gave me something to think about, even though my hammock set-up is a little better. beautiful pictures! That’s great. I’m glad the ‘Lesson’s Learned’ proved useful. What’s your setup? I’m always looking for ideas!